In December 1923, Margaret (Many-Goats) Begay gave birth to her only child. Joe Begay's birth made his father Robert happy, because he was worried they wouldn't ever have a child. Joe lived and grew in the land between the Sacred Mountains, what the People call the Dinetah. 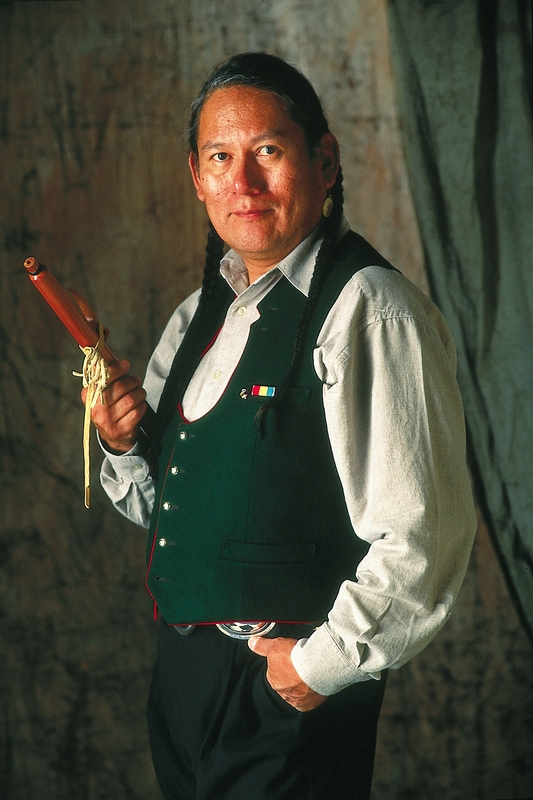 His grandfather taught him the ways of magic — as the Navajo understood them — and learned to walk in beauty and harmony as Changing Woman taught. Just after Joe turned eighteen, the Japanese attacked Pearl Harbor. Joe decided to join the US Marine Corps and eventually became a member of an elite group called “the Navajo Codetalkers” He and the other men would communicate via radio and transmit messages using the complicated Navajo language which had been altered even beyond normal usage for this purpose. When his tour of duty was over, Joe took advantage of the G. I. Bill and was encouraged to attend Harvard. He did so, majoring in law. He studied hard for eight years, going home to the Dinetah every summer for at least two weeks to keep up his training as a Ha'at'ali (singer / medicine man) of his people. At the end of the eight years, he had a doctorate in law, specializing in international law, including treaties and trade. He came home and began working with the tribe, helping make laws and going between the Dineh and others. Joe was extremely glad to return to the Dinetah for good, and when he did, he married a woman who lived near his family named Anna Tsossie. They had three children fairly close together. Jim was the oldest, and he was learning the ways of the Ha'at'ali from him, just as he had learned from Horse Kicker. Eddie was their second-born. He decided to become an artisan and worked with silver to make conchs and bracelets and other jewelry. Their daughter was named Katherine, and she was just in high school, running in track, when disaster struck the family. While Joe was out on assignment for a week at a BIA conference, his family was struck with the hantavirus. His wife and all three children succumbed quickly, and by the time he got home, his entire family had died. As is customary for the Navajo, Joe knocked a hole in his hogan and never lived in it again. He was heartbroken, and with the death of his family, had nowhere to go. The tribal leaders knew it, and subtly arranged for work away from Dinetah. The Secretary of Magic himself called with an offer. Joe readily accepted and was soon on his way to South America to negotiate with Venezuelan and Colombian wizards. He found himself using all his skill and enjoying it much more than he had enjoyed a lot of other things. When that assignment finished, the Secretary found another job quickly for him. This job would take him to Great Britain, and was going to be of a longer duration. Joe arrived in London and liased with the Ministry of Magic. He's working now with the Department of International Magical Cooperation as an Ambassador and troubleshooter (though the latter isn't widely known). He carries a wand, though he seldom uses it, preferring the older and slower native forms of magic taught to him by his teacher and family. Joe is a Navajo. He welcomes long silences, and adapts to the world, rather than expecting the world to adapt to him.